Fatiha became my constant companion for the remainder of my stay in Morocco and I could not have wished for a more charming one. We confined our haunts to the beach, the hotel terrace and the downstairs bar next door to the hotel, and I held no desire to stray further. Of an evening Fatiha headed home an hour prior to Cinderella’s magic hour. One afternoon we did stray further afield from our natural haunts, when we took a taxi into Tangiers and Fatiha took me on what turned out to be a ‘bar crawl’. The bar’s interior decor bore traces of the proprietor’s original intention of wishing to create the atmosphere of a British pub. There was a dartboard on one of the walls, an outdated brewery’s advertising calendar depicting a typical British country village, and a few cracked and chipped ashtrays bearing the logo of a British brewery. The bar was crowded and we had to settle for a barstool. Fatiha introduced me to George, the proprietor; he appeared to be in his sixties and still looked very active. Finishing our first drink, and as I ordered refills, Fatiha paid a visit to the toilet. “What? !” I exclaimed, unable to picture Fatiha as the stereotype of a gangster’s moll. “A what?” I asked, unaware of the meaning of the term. “Good heavens, no!” I indignantly retorted. The very suggestion of being involved in such a despicable trade appalled me. I wholeheartedly agreed with Fatiha’s opinion. 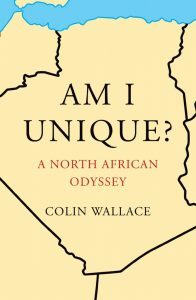 Extracted from Colin Wallace’s fascinating memoir, telling of drugs, the Foreign Legion, and the Algerian war. Buy ‘Am I Unique?’ here.